Sarah is a beautiful woman who was presented to Dr. Cynthia Kelly in July of 2010 with a small mass in her right wrist. Fifteen years earlier, Sarah had undergone removal of a similar mass in the same location in New Jersey. Shortly after noticing the return of sensitivity in the area, Sarah was diagnosed with Synovial Cell Carcinoma and had the mass removed. Four surgeries later, Sarah maintains close follow-up care with Dr. Kelly in order to avoid another occurrence. In spite of her extended battle with cancer, Sarah shines with positivity and exuberance for life. She lives a true “Colorado” lifestyle taking advantage of the gorgeous outdoors and hiking as often as she can. Sarah finds comfort and joy in her passion for music, and spending time with loved ones. Sarah’s strength is rooted in the people she surrounds herself with. Her family, friends and even co-workers have given Sarah love and inspiration during the difficult moments in her journey. Her positive outlook is apparent by the gorgeous smile she humbly wears on a daily basis. 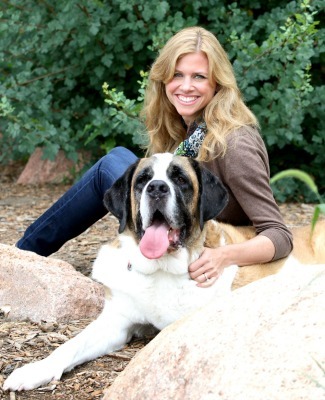 Penni is a dazzling five-year old St. Bernard! Penni had osteosarcoma of her right distal radius and received an amputation in January of 2013. Penni’s size hasn’t limited her in any way and she adapted to her amputation with flying colors. With a jolly attitude, Penni spends her days either laying in the sun or lounging with her loving family.